If you fashion yourself a shopper, welcome to paradise. The adrenaline rush of a dusty flea market discovery whets the appetite of many an adventurous antiquer, here. The lusty laughing of the robust bargain brigades echo everywhere. Just as surely as the discriminating tastes of the ultra fortunate are easily met. 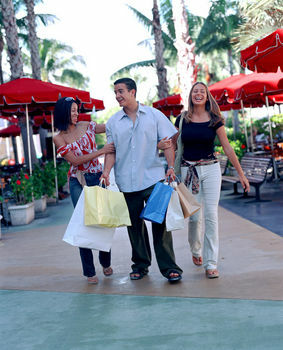 The Esplanade Shoppes Marco Island - Amidst the coastal atmosphere on Marco Island...The Esplanade Shoppes. Amid the lush tropical landscaping, the arcaded storefronts consist of fine dining, upscale retailers and small specialty stores. The Shoppes overlook the central promenade featuring a bayside sunset. This is the ultimate in shopping experience - all gracing more than 1,100 feet of waterfront on Smokehouse Bay. p> Tin City - Waterfront shops and restaurants. Tin City Waterfront Marketplace is Naples' original shopping sensation. In a setting which recalls Naples' nautical past, you'll find more than 40 creative boutiques and great restaurants. Authentically Naples, Tin City lets you discover local treasures of yesterday and today. Sunshine Ace - "Our friendly, knowledgeable employees take pride in answering customer's questions and helping them locate quality products to best serve their needs." Offers hardware, sporting goods, paint, equipment rentals and more. Wynn's Market - Naples - The best groceries, produce, meats, and baked goods available in Naples Florida. Deli, catering, wines, organic products, gift baskets - now order lunch online! Bayfront Naples - Bayfront is strategically situated on Naples Bay and at the foot of Fifth Avenue South, there is nothing modest about this upscale oasis. Bayfront's colorful European architecture is an eye catching and memorable landmark in Old Naples. Strolling on brick-laden pathways, shoppers have intimate access to all their needs. Rare finds in the shops coupled with the impeccable cuisine of the restaurants take the Bayfront experience to a new level. There's always a new opportunity to enhance the day at Bayfront. World-class crafts by famous designers and artisans are found in their stores. Highly trained culinary teams work in their kitchens. The restaurants' gourmet fare is complimented by an atmosphere ranging from informal to lavish, depending on the diner's mood or taste. The shops are detailed in exquisite woodwork, imported stone, artistic displays and staffed by friendly, knowledgeable representatives to complete the "total" shopping experience.